Also Known As: "Agnes Webbe"
Sir John Alexander Webb (1484-1516) - 15th GRGR, an officer in King Henry VIII's army, had four children by an unknown wife, including Mary, Abigail, Sir Henry Alexander Webb and Margaret. Our family is related to Mary and Henry. Mary Webb (1512-1550)  married Robert Arden (1506-1556) and had 2 daughters. 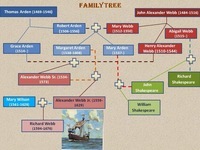 Abigail Webb Shakespeare (1515-  ) married  her first cousin, Richard Shakespeare in 1532 and had 2 sons- John and Henry. John Shakespeare also married his first cousin Mary Arden (1537 -  ), daughter of Robert Arden & Mary Webb (Abigail's sister), in 1557. They had eight children including William Shakespeare. Sir Henry Alexander Webb (1510-1544):    Presumably named after King Henry, he was an usher in the Privy Council of Queen Regent Catherine Parr (King Henry's 6th wife), who granted him lands and privileges for his service. Henry married Grace Arden (1514- )  (daughter of Thomas Arden) and had three children:  Alexander, Agnes and Robert. Sir Alexander Webb Sr. (1534-1573) also married his first cousin, Margaret Arden (1538-1608)  who was the daughter of Robert Arden.